Memphis, TN – Cheerleaders from Los Cuates Middle School is one of more than 500 elementary, junior high and high school cheerleaders and dancers from across the country that will represent Varsity Spirit in the 2018 Thanksgiving Tour at the Walt Disney World® Resort in Orlando, Florida. Spirit camps earn the chance to march in a holiday parade of this caliber. 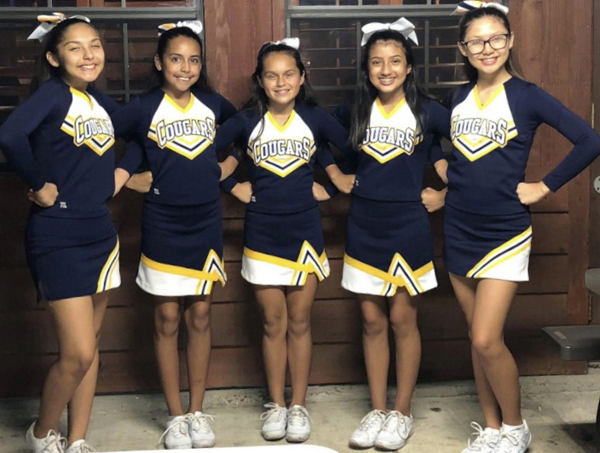 Students Emily Silva, Adely Delgado, Kira Camacho, Kaylah Vasquez, and Clarissa Rodriguez will perform with the Varsity Spirit All-Americans in an one-of-a-kind pre-parade performance through Disney’s Magic Kingdom® Park on Thanksgiving Day. Besides enjoying a sunny trip to Orlando, All-Americans will have the opportunity to meet cheerleaders and dancers from across the nation and enjoy a magical holiday season at Walt Disney World® Resort parks. The Varsity All-American program is celebrating more than 30 years of choosing camp standouts. For more information, visit www.varsity.com or contact Ian Betti at (800) 238-0286 or ibetti@varsity.com.